Bouquet garni is a bundle of herbs usually tied together with string and mainly used to prepare soup, stock, and various stews. The bouquet is cooked with the other ingredients, but is removed prior to consumption. There is no generic recipe for bouquet garni, but most recipes include thyme and bay leaf. Depending on the recipe, the bouquet garni may also include parsley, basil, burnet, chervil, rosemary, peppercorns, savory and tarragon . Vegetables such as carrot, celery (leaves or leaf stalks), celeriac, leek, onion and parsley root are sometimes included in the bouquet. They are often tied inside two pieces of leek leaf or in a piece of cheesecloth. Sometimes, the bouquet is not bound with string, and its ingredients are filled into a small sachet, a net, or even a tea strainer, instead. Traditionally, the aromatics are bound within leek leaves, though a coffee filter (or cheesecloth) and butcher twine can be used, instead. 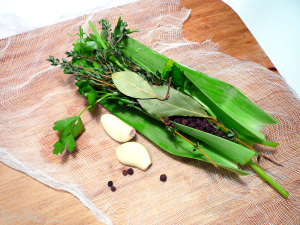 How to make Bouquet Garni.